Last Updated: June 1, 2018, 2:55 p.m.
classroom experiments conducted with a sensitive Geiger-Müeller Detector using NORM source materials and consumer products to provide teachers and students with real, personal experience with ionising radiation. Teachers who have a lower-sensitivity Geiger instrument at hand may find this note on using low-sensitivity Geigers with the workshop experiments useful. December 4, 2009 at the York Region District School Board Science Seminar held at Newmarket High School. March 1, 2010 at the Rocky View School District Teachers Professional Development Day held at Burt Church High School, Airdrie AB. May 1, 2010 at the Ontario Association of Physics Teachers Annual Conference held at the University of Toronto. November 12, 2010at the Science Teachers’ Association of Ontario (STAO) Annual Conference in Toronto, ON. February 18, 2011 at the Toronto District School Board Secondary Science Teacher's Conference. April 8, 2011 at the Renfrew Country District School Board Science Seminar. October 20-21, 2011, Alberta Teachers' Association Science Council Conference, Lake Louise, AB. October 28, 2011: Association of Science Teachers (Nova Scotia), Halifax, NS. November 10, 2011: Science Teachers’ Association of Ontario (STAO) Annual Conference in Toronto, ON. December 2, 2011 at the Ontario Institute for Studies in Education, Toronto, ON. February 17, 2012 10:30-11:30 at the Toronto District School Board Secondary Science Teacher's Conference at Marc Garneau SS. February 17, 2012 2:00-3:00 at the Durham Region School Board Everything Science Conference at Maxwell Heights SS in Oshawa, ON. November 15-17, 2012 at the Alberta Teachers' Association Science Council Conference, Banff, AB. February 15, 2013 at the Ottawa-Carleton District School Board Science Professional Development Day at Brookfield High School, Ottawa, AB. October 25, 2013: Association of Science Teachers (Nova Scotia), Halifax, NS. November 16, 2013, Science Teachers’ Association of Ontario (STAO) Annual Conference in Toronto, ON. November 1, 2015, Science Teachers' Association of Ontario (STAO) Annual Conference in Toronto, ON. February 16, 2018 at the Toronto District School Board Eureka! Science Teachers' Conference at Marc Garneau SS. The most recent workshop notes and presentation files are available for download (right click and save as). Workshop notes (PDF) (Version 2.0 2018-02-07) Includes the Hot Balloon experiment! Note: Power Point files may be set up for projection on a second display. In creating this workshop, the CNS ECC collaborated with a retired teacher in Ontario and a working teacher in Alberta. Renfrew County District School Board science teachers helped evaluate the CNS ECC approach. Feedback from workshop presenters and attendees have resulted in many changes to this workshop.The full scope of this workshop requires 90 minutes. Many presentation opportunities are constrained to less than 60 minutes. The content has been broken into segments to provide sufficient time for the teachers to gain hands-on experience with the Geiger system for a given event. If you wish to have the workshop presented at your Science Teachers' Conference or similar event, please contact the CNS! The CNS Geiger Kit donations in 2018 have included some based on Black Cat Systems GM-45 USB Version hardware and software. The software is supplied for both Mac® and PC Windows®. This software provides an alternative presentation of the data on the computer display. If you have an existing CNS Geiger Kit and are interested in exchanging it for a Mac®, please contact the CNS! CAUTION FOR USB-MSP INTERFACE USERS! Please leave your USB cable connected to the interface. One interface was retuned to the CNS with the mini USB connector extracted from the interface and stuck on the mating cable connector. The damaged interface is not repairable. less than $5 in most grocery stores in Canada. About $1.20 per kBq of 40K! The CNS Nu-Salt ... (K-40) Fact Sheet has been updated -- see below! The CNS software from Aware Electronics works after upgrading to Windows 10. An article on NORM (reproduced with permission), by B. White of the CNS ECC, was published in STAO's "Crucible" prior to the 2008 Workshop presentation. An article entitled "Henri Bequerel, Winner of the 1903 Nobel Prize in Physics: A Change of Hypothesis" published in Crucible in 2013 is reproduced with permission. Another article on the Hot Balloon Experiment (reproduced with permission), was published in Crucible prior to the 2011 Workshop presentation at STAO. A PDF version of Thomas A. Walkiewicz 1995 paper: "The Hot Balloon (Not Air)" is posted with the permission of The Physics Teacher (American Association of Physics Teachers). The Jefferson Laboratory has a series of videos on the measurement of the half-life of barium-137 as the Frostbite Theater: Part 1, Part 2, Part 2e, Part 3. Students may collect and analyse the data from the videos. Tasha Richardson has a website featuring remote access interactive labs for science students (presented a workshop at STAO 2017). The CNS workshop references the brochures below. Please check back here for the most recent version of these files and new ones. An enlarged version of USA DOE Office of Science Low-Level Radiation Dose Ranges chart. The CNS has donated Geiger kits to 204 Canadian high schools from Halifax NS to Grande Cache AB as shown in the Google Earth® image & searchable map above (7 of these are considered to be lost). 7 have been returned from schools, refurbished and placed with new schools, leaving 190 nominally in use. The photo shows a typical CNS Geiger Kit circa 2011-2012. The Canadian Nuclear Safety Commission sponsored the donation of 15 Geiger Kits in the spring of 2018. It is planned to donate a further 20 Geiger Kits in the fall of 2018. Atomic Energy of Canada Ltd. sponsored 14 Geiger Kit donations in 2014. The Canadian Nuclear Association co-sponsored the 25 donations in 2013. Kinectrics Ltd. sponsored 1 donation in 2009. Additional sponsors would be most welcome. If you are a science teacher at a Canadian high school and wish to obtain a Geiger Kit for your school, please contact the CNS. Your request will be added to our list, and it will be addressed when resources are available (40 are on the list). In the interim, if your school is near one of those in the list of schools with Geiger kits, you may be able to borrow one from a colleague. The highlighted schools are the most recent recipients. The Geiger interfaces with a personal computer running most versions of Windows®. The donations in 2018 have included some based on Black Cat Systems GM-45 USB Version hardware and software. The software is supplied for both Mac® and PC Windows®. This software provides an alternative presentation of the data on the computer display. Note: if you have updated to Windows® 7+, please contact the CNS for a compatible interface. If your interface provided by the CNS does not look like either of the ones shown in the photos below, it is not compatible! CAUTION FOR USB-MSP INTERFACE USERS! Please leave your USB cable connected to the interface. from the interface and stuck on the mating cable connector. The damaged interface is not repairable. 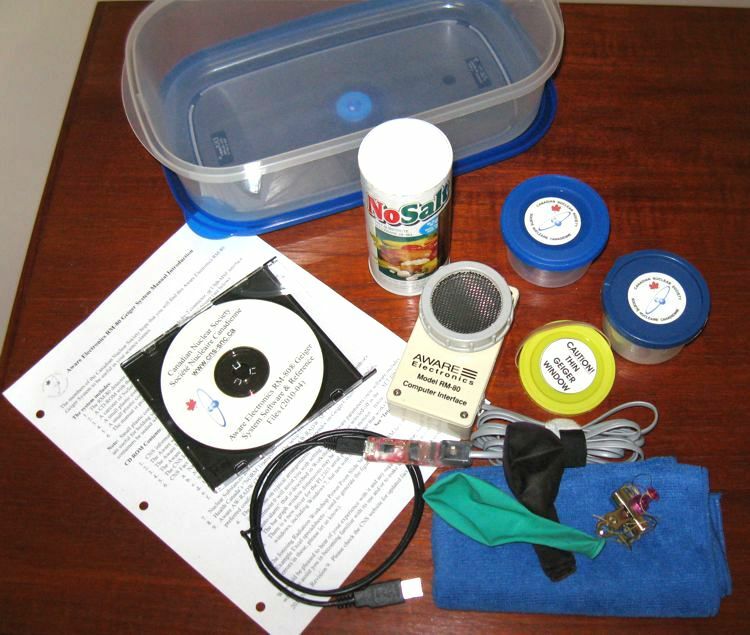 The CNS Geiger Kit since 2012 includes an Aware Electronics RM-80 Geiger detector with a protective cover, cables and a USB-MSP microcontroller interface, software and support material on a CD, a container of potassium chloride: Salt Free® or NoSalt®, a small sample of KCl and a sample of clumping cat litter each in a plastic container useful for monitoring the activity of samples, and the Hot Balloon kit supplement. If you have a CNS Geiger Kit and wish to receive the Hot Balloon kit supplement, please contact the CNS. Note: the thin plastic containers included in the kits supplied in recent years do not produce the same results as described step 5 of Experiment 2. The thin bottom and greater height of the container change the results. The small plastic containers with replaceable lids that some Heinz® baby food is packaged in perform better (geometry is important). New in 2012: Aware Electronics have provided the CNS with a custom version of their Aw-Radw software. This includes an install program compatible with the Windows® Installation Wizard. The install program is available for use with serial port interfaces such as classical serial port or a USB-serial port adapter (using the Prolific chip set) where the drivers are handled separately.The green USB-serial port adapters supplied previously by the CNS are compatible with Windows® XP, but not with Windows® 7. The install program for use with Aware Electronics USB-MSP interfaces (using the FTDI chip set) includes the option of installing the drivers. Either version will place a shortcut on the desktop as an option. This launches the program with the CNS-preferred parameters and the data logging to file is not started. The CNS provides an installation guide with the software and a video. If you have an existing CNS Geiger Kit and wish to try the new software, please contact the CNS and we'll send you an update. Note: anti-virus / malware software may quarantine the Aware program. You must give it an exception to enable it to run. The new version of the Aware program is less likelyto be affected. Some school IT systems make it difficult for teachers to install the software. If you experience these problems please -- contact the CNS! What do science teachers say about using the Geiger Kit in their classroom (only the positive comments ...)? 3. describing the uses and effects of various radioactive substances, etc. As I taught this section, the RM-80 Geiger and the use of the computer software enabled the students to observe the decay of various substances, including many that are household items, and to easily obtain data that could be used to identify the types of decay and to plot a reliable decay curve to determine the half-life of the sample. This procedure could not be possible in the classroom before. Previously, all that could be done in the classroom was a demonstration of decay of a purchased sample of radioactive substance with a relatively inexpensive radiation detector. Most schools do not have the budget to purchase a detector such as the RM-80 and the computer software." "Our High School received a Geiger Counter last spring. It is used for demonstrations in both 6 and 9 science. This would be approximately 3 uses per school year. The Geiger counter is working well. It is nice that it is hooked to our laptops so that the graph produced can be projected for all students to see." "I greatly appreciate the opportunity to use it in my classes. It is a terrific tool in helping me get my students interested in the sciences. Few of my students know much about radiation and nuclear energy so the Geiger kit really opens a door for them to many things they have never explored before." "Put my Geiger to work in a class today. Turned it on and let it run with volume up loud until someone asked what that ticking noise was. When I explained that it was background radiation being detected, they asked "Is that safe?". Needless to say, lots of good discussion ensued. Thank you for the Geiger and the program and the booklet. Am putting it to use in my Grade 11 physics class this week." "My class was quite thrilled yesterday to test various substances and see the plots develop on-screen." "We are still using our kit and loving it!" "We still have the kit. I have used it, and intend to use it again when we study radioctivity later this semester." "My students are always fascinated by how much radiation there is to be detected just within our classroom. Thank you again for supplying these kits!" "The Geiger Counter is up and running and is used as a part of our curriculum delivery every semester. Thank you once again for this excellent equipment." "The Geiger Kit is in use by Physics 30 classes at Sir Winston Churchill High School. The newer software is much appreciated, as we have migrated to Windows 7." "The sampling worked very well, and students were quite surprised to see the variation of radiation with different objects, and even with the background radiation." We'd be pleased to hear about your experiences with your CNS Geiger Kit - the good, the bad and the ugly. A few lines in an email would be most appreciated: contact the CNS! The CNS has two Geiger kits available for loan to student projects for Science Fairs in Canada.These include an RM-70 detector that is less sensitive than the RM-80 included in the kits donated to teachers. No software is included. The interface provided displays Geiger pulse counts as selected. One student has used one of these kits in her science fair project. A sample of clumping cat litter (bentonite clay) in a plastic container that also contains potassium. A copy of the Aware Electronics Manual with supporting information. Students may obtain the loan of a Geiger Kit by arranging with their science teacher to contact the CNS and make the request on their behalf. The Canadian Nuclear Society will confirm with the teacher, and the kit will be sent to the teacher. The teacher will be requested to store the packing material for the future return of the kit to the CNS. The teacher will repackage the Geiger Kit, print and affix the label, and arrange for pickup of the shipment by UPS. During the Annual Science for Educators Seminars formerly held at AECL's Chalk River Laboratories, science teachers were introduced to some of the material that is included in the Ionising Radiation Workshop. Other activities included the use miniature cloud chambers, and the use of the Geiger detector to estimate the half-life of Ba-137m produced in a commercially available radioisotope generator. To address the material needs for classroom use in addition to the Geiger Kit Donation program above, the CNS ECC can assist schools in the acquisition of: cloud chambers; flashlights; uranium-containing rock samples and other radiation sources; a Ba-137 radioisotope generator; smoke detectors. Teachers will be expected to provide dry ice and alcohol for cloud chambers and an IBM-compatible computer for data acquisition from the Geiger detector. Note: the Ba-137m generator contains 370 kBq of Cs-137 in excess of the 10 kBq exemption quantity specified by the Canadian Nuclear Saftey Commission. Owners of this source in Canada are required to hold a licence issued by the CNSC. Download the 1998 handbook Nuclear Experiments in the Classroom (PDF) which describes each experiment in detail. The handbook also provides contacts for obtaining the necessary equipment, as well as persons who can provide more information. Download the PDF version of the shorter booklet: RADIATION ENCOUNTER!, used as supplementary material at a hands-on cloud-chamber demonstration held at the Ontario Science Centre (Toronto, Ont.) on 2002 January 26th.